Extended Interstate 66 HOV hours and high morning tolls aimed at reducing the number of cars hitting a chokepoint passing the Dulles Connector Road appear to be the biggest drivers of traffic changes since tolls for solo drivers began in December. WASHINGTON — Extended Interstate 66 HOV hours and high morning tolls aimed at reducing the number of cars hitting a chokepoint passing the Dulles Connector Road appear to be the biggest drivers of traffic changes since tolls for solo drivers began in December. A new state review of traffic and tolling data on I-66 and parallel roads over the first six months finds more concentrated and severe eastbound traffic delays through the Rosslyn area now than in the same period last year between 8 a.m. and 9:15 a.m., but significantly reduced traffic jams on I-66 inside the Beltway elsewhere and during other tolling hours. 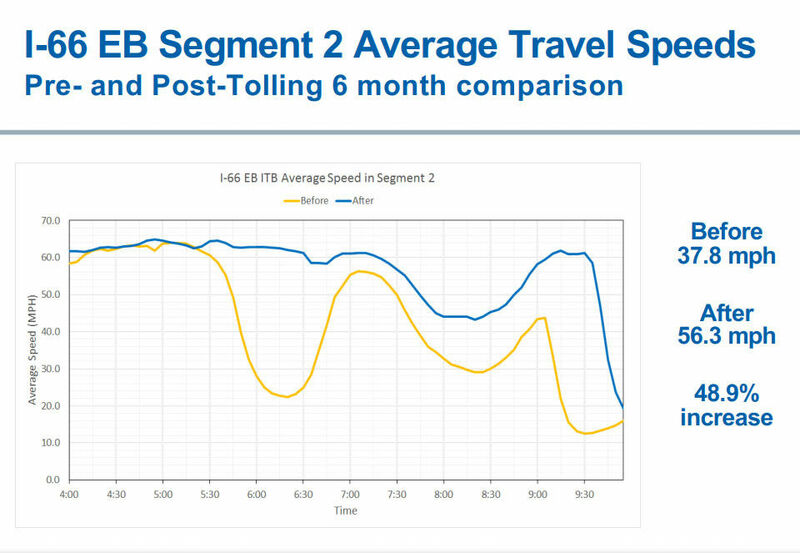 In the morning, faster speeds in the segment of I-66 past the Dulles Connector account for the most significant portion of the improvements along the entire corridor. Traffic speeds stay steadier there than in the past through about 7:30 a.m., with no more rush to beat the old HOV hours that had slowed traffic from about 5:30 a.m. to 7 a.m. The higher tolls in the morning — the average $8.49 paid compared to $4.60 in the afternoon — also appear to deter enough drivers from using the road to help keep traffic moving. Virginia is in the process of widening I-66 in that area, with construction expected to be completed in about two years. Some of the biggest changes overall since December, in the morning as well as the afternoon, are in the periods where commuters used to flood I-66 to get in or out just before or after old HOV restrictions ended. Now, the HOV period has been extended from 2 1/2 hours each way to four hours each way — 5:30-9:30 a.m. and 3-7 p.m. The same types of slowdowns still happen on the fringes of the new HOV hours as the old ones, but not to the same degree. Still, a significant slowdown begins approaching the Potomac River starting around 7:45 a.m. that bottoms out between 8:30 a.m. and 9:15 a.m. The highest toll rates continue to be between 8 a.m. and 9 a.m., when HOV usage also peaks. “VDOT is testing modifications to (the) tolling system to evaluate opportunities to move more people,” a review summary said. In the first six months of tolling, 0.28 percent of toll payers paid more than $40 for a single trip. A separate new report on May tolling finds 1,786 trips priced at $40 or more that month. The average price paid in May when including trips along only a portion of the corridor was $9.39 in the morning and $5.25 in the afternoon. In May, traffic on Interstate 66 was slower than the same time a year earlier eastbound from about 7:45 a.m. to 9:15 a.m., but was faster between 5:30 a.m. and 6:45 a.m. and 9:15 a.m. to 9:30 a.m. — the edges of the old HOV hours. In the evening, traffic in May was mostly faster than a year earlier, with a slight slowdown from around 5 p.m. to 5:30 p.m. Alternate routes in May were generally slightly faster than the same time a year earlier, except for certain times on the George Washington Parkway. Over the full December-through-May period, changes for parallel routes in the morning vary based on the exact time of a commute, with periods earlier in the morning when Route 50, Route 29 and the George Washington Parkway are slower than a year earlier, and some periods later where they are faster. While the state says Route 29, Route 50 and Route 7 are faster overall on average in the morning rush, the GW Parkway is slower than the previous year from 8:30 a.m. to 10 a.m. 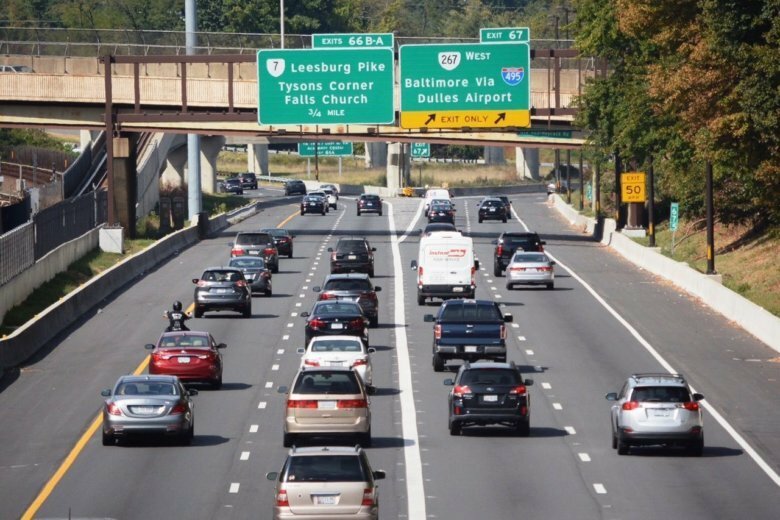 In May, 12.1 percent of vehicles using I-66 during the HOV or tolling hours rode without an E-ZPass, exposing the drivers to potentially expensive bills in the mail. Meanwhile, 44 percent of vehicles rode free with an E-ZPass Flex switched to HOV mode and at least two people in the car (motorcycles also ride free); 43.9 percent of vehicles had an E-ZPass in toll-paying mode. Over the first six months, 49 percent of morning trips were taken for free with an E-ZPass Flex and at least two people in the car, while 37.9 percent of evening trips on average met HOV requirements. Since the tolling and expanded HOV hours began, an average 13,688 daily trips eastbound and 16,496 daily trips westbound have been recorded during the four-hour tolling periods. The office of Virginia’s secretary of transportation said there have been fewer crashes on I-66 since tolls began than in the same period a year earlier.